Position rack in the middle of oven. Preheat oven to 375˚F (190˚C). Spray the top of a muffin pan with nonstick coating, and line with paper liners. In a large bowl, cream together the butter, 1 ¼ cup sugar and salt until light and fluffy. Beat in the eggs one at a time. Mix together 1 ¾ cup of the flour and the baking powder. Beat the flour mixture in with the buttermilk, mixing just until incorporated. 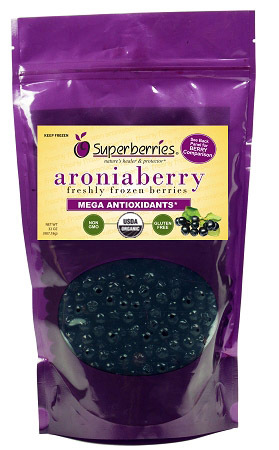 Crush ¼ cup of the blueberries and ¼ cup of the Superberries aroniaberries, and stir into the batter. Mix the rest of the whole blueberries and Superberries aroniaberries with the remaining ¼ cup of the flour, and fold into the batter. Scoop into muffin cups. Sprinkle tops lightly with sugar. Bake in preheated oven for 30 minutes, or until golden brown; tops should spring back when lightly tapped.